PARIS (Reuters) - France's largest listed bank BNP Paribas cut its profit and revenue growth targets for 2020 on Wednesday, after weak financial markets hit revenues in the last quarter of 2018. BNP Paribas now expects a return on equity of 9.5 percent in 2020, down from a prior target of above 10 percent. The bank also lowered its revenue growth target to 1.5 percent per year between 2016 and 2020, from 2.5 percent previously. The downgrades came after revenue fell 1.5 percent in 2018 to 42.52 billion euros ($48.5 billion). That included a 40 percent plunge in revenues, as well as a pretax loss, at its global markets investment banking and trading arm in the fourth quarter as financial markets slumped. BNP Paribas shares fell 2.9 percent in early trade, lagging a 0.4 percent drop in France's benchmark CAC-40 index and a 0.7 percent fall in the STOXX Europe 600 bank index. "A miss in markets. Fixed income, currencies and commodities down 14.7 percent year-on-year, equities down 70 percent year-on-year - both the worst results since 2013," said brokerage Jefferies of the fourth-quarter figures. Fourth-quarter group revenues fell to 10.16 billion euros from 10.53 billion a year earlier. Analysts surveyed by Infront Data had forecast revenues at 10.33 billion. Net profit was 1.44 billion euros, up from 1.43 billion a year earlier and ahead of analysts' forecast of 1.41 billion. Large European banks such as BNP Paribas are struggling to find new profit sources after years of rock-bottom interest rates have limited returns in retail banking, while corporate and investment banking is vulnerable to financial market swings. 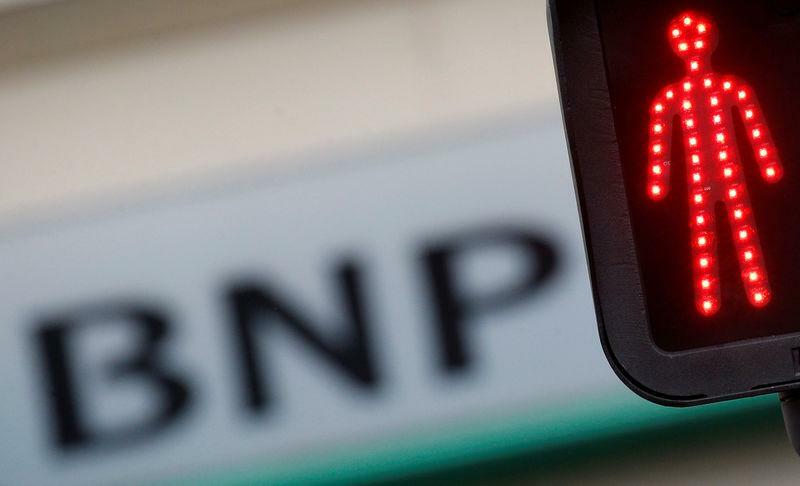 Two of BNP Paribas' smaller local rivals - Societe Generale and Natixis - have released profit warnings in recent weeks because of losses on market operations. Last week, Deutsche Bank also posted a bigger-than-expected quarterly loss at its investment bank. BNP Paribas attributed the dismal performance of its global markets division to customers shunning certain instruments as prices plummeted. A deficient hedging strategy on an equity derivative portfolio also caused a 70 million euro loss. The bank said it had decided to speed up a programme to streamline its corporate and investment banking arm. It plans to exit "non-strategic, subscale or unprofitable segments" after already closing its proprietary trading desk and its commodities desk in the United States. It will also cut costs by an additional 350 million euros this year and the next and accelerate automation. The only bright spot in the fourth quarter was the bank's International Financial Services arm, which includes insurance, asset management, consumer lending and other businesses. BNP Paribas proposed a 2018 dividend of 3.02 euros per share, stable from last year.